DOGS PERMITTED? Sorry, Dogs are NOT considered at this property. Camden is the premier location in Mid-Coast Maine and Bayview Street is arguably one of the nicest streets. 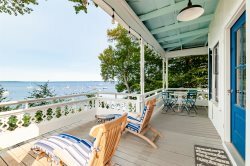 Built in 1890, with much of its classic charm and appeal intact, the Bayview Aerie cottage enjoys many modern updates throughout - including new kitchen appliances for 2018. A relatively open floor plan includes a great kitchen for entertaining, a dining table to host the whole family, and a tasteful mix of new and antique furnishings. Traditional, somewhat steep, stairs lead from the main entrance hall to the main side second-floor bedrooms and large tiled shower bathroom. From the stairs, enter the main living area, dining room with room for a Thanksgiving dinner. Continue further to the kitchen and 3 season, enclosed, screened porch where you can watch others stroll into town or relax after a day of walking to have a favorite cocktail. Down the hall from the kitchen are stairs up to the apartment over the barn or the full bath with clawfoot tub, patio access or washer/dryer. Take a step back in time as you walk down Bayview Street to town or down to the park. There is a remarkable collection of antique New England homes, many with front porches and barns, creating a shady retreat in summer. The house sits just two blocks from the center of Camden and Camden Harbor with its shopping, restaurants, and harbor park. Bayview Aerie is also very close walking distance to the Laite Beach & Park. You will be delighted with all of the area amenities you have access to within easy reach. Air Conditioning: No, but their are fans in each bedroom. Ceiling or pedestal. BEACH CLASSIFICATION: We have categorized this property as having or being near a sandy beach. More specifically for this property - it is a short 2 minute walk to the pea-sized pebble and sandy town owned public beach called "Laite Beach". There is not an actual usable sandy beach at this property (it's not even on the water), but the nearby beach is great for kids and that is why we have classified it as being on or in this case - "near" a sandy beach. Please see our Rental GuidelinesPage for further questions regarding how to book this property and additional charges and fees. Contact a reservation agent for more details or to ensure you are booking the right property for you.